Local listing is one of the most effective internet marketing strategies. It is an online entry process which contains your business name, address, phone number and other details as well. With it you can put your business on the map quite literally. It typically focuses on anybody in your area searching for any relevant keyword and the search gets redirected to your site. It also generates a huge chunk of traffic for your site. Google local listing builds a close connection between users and their local businesses. Every business organization may it be big or small, aspires to explore its business to every corner of the globe. Google Local listing can prove as one of the best marketing and branding platforms in order of conversions. It dynamically increases the sales of the business. You can also rank on top of the Google page so that your website is more visible to the visitors. It helps your business grow at a higher pace by implementing Google local listing optimization. For a better clarification, you can contact our well-skilled experts at Tech Support Dubai. We work with an award-winning team who are highly experienced in the process and can guide you in the right way. Our experts are capable to fulfill all your requirements to promote your business. Hurry and contact us to know more about local business listing process. Your search for reliable service ends with us. We help you in locating your business with all the modern techniques and advancements. As Google Listings enhance the visibility of your business, you can easily highlight your business to the local customers. 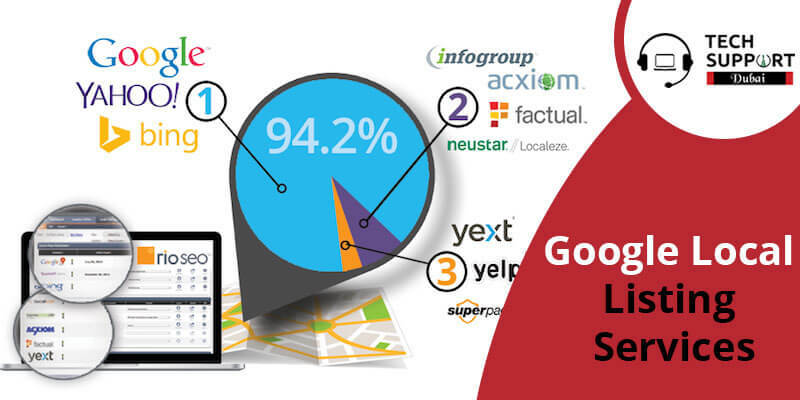 You can get best results out of your local customers who have been searching for you. It drives targeted customers to your website from any specific geographic area, in order to drive traffic to your website and ultimately gives you qualified leads. Not only we provide services, but also offer easy maintenance tips as well. We have earned a reputation for providing the best Google listing service in entire Dubai. Before opting for our services, have a look at the benefits that we offer. If you are searching for an affordable service provider in Dubai to assist you with Google Local Listing management, the experts at Tech Support Dubai are the best to choose from. Just place a call at our helpline number: +971-523252808 and interact with our highly qualified experts. We will guide you with best techniques and methods to develop your business. Our specialty is that we listen to our clients, understand their requirements and then come up with potential solutions. In case you are too busy to talk, you can also avail of our online service. Drop us a mail enlisting your worries at our registered mail id and one of our executives will get back to you in the next 24 hours. We also provide SMO Service in Dubai.